After spending four months planning my trip and forking out more than US$3,000 on flights and lodging, the time had come to begin my first solo international trip and my first trip to South America. With my 30-pound backpack and a whole lot of optimism in tow, I boarded the first of three flights to get to Cusco. Lima broke me. I landed at 4 a.m., after a five-hour layover in Miami, and I was exhausted. My flight to Cusco didn’t leave until 7:30 a.m., so I stretched across a row of seats by my gate, hugged my backpack, and tried to sleep despite the bitter cold and the noisy passengers. As I lay there shivering, sleep deprived, and afraid (I had heard so many things about how dangerous Lima is), I began to question everything about my trip. I longed to be sleeping in my own bed at home (I know, I’m a travel wimp). My optimism had quickly faded. Here’s how to get to Cusco from Lima. There are two main ways: plane or bus. I took the plane all three times I made the trip. **Please note this information was derived from my trips to Cusco in 2014, so some details may have changed since then but overall this guide should be helpful. Every flight from Europe or North America to Cusco will have a layover at the Jorge Chávez International Airport in Lima. a) On this form, read the “Items Exempt From Customs Duties” list. This includes most items the average traveler would be carrying. If the total value of your items that are NOT included in that list exceeds US$1,000, then you will have to pay taxes to bring them into the country. b) If you are carrying more than US$10,000, or its equivalent in another currency, you will have to declare this on the form. c) Remember Customs agents could decide to go through your bags, so do not lie about what you have in them. a) Under “Main Purpose of Travel,” check “Holiday” if you’re traveling there as a tourist. b) For “Amount Expended During Your Stay,” leave it blank. You do not need to fill this out. c) For “Type of Lodging – Address,” if you do not yet know where you will be staying, you can just put “Cusco.” I have always done this and never had a problem. Once you land in Peru, you will go through Immigrations (Migraciones) and receive an entry stamp on your passport. You will also hand them your completed Tarjeta Andina; they will tear half of it off for their records, and then give you the remaining half to keep. Do not lose this card. You must show this card to be able to leave Peru. If you do lose your TAM, you can get a replacement. Visit the nearest immigrations office, oficina de migraciones, to begin the process of getting a new TAM. 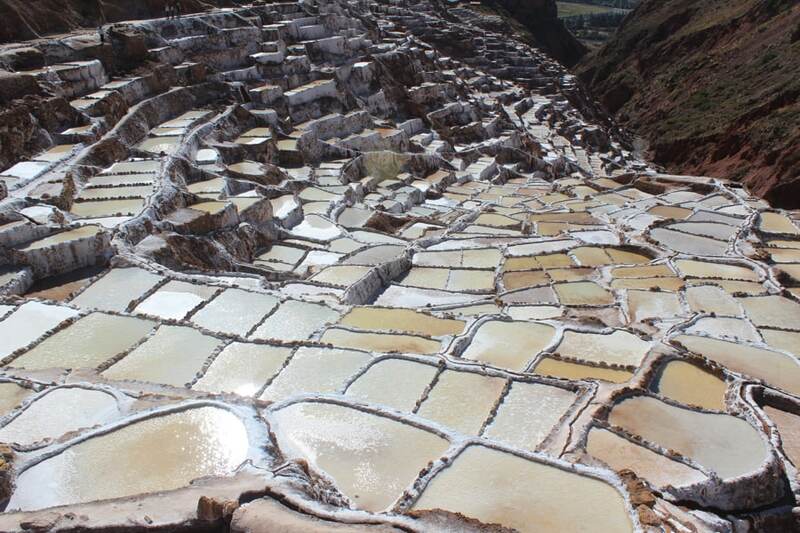 Why are you traveling to Peru? This question is interesting because it affects how long of a tourist visa (entry stamp) they’ll give you. When they stamp your passport, they will also write how many days you’re allowed to stay in the country. Every time (three times so far) I have entered Peru, they have given me 30 days more than what I asked for. So keep this in mind. Also, it never hurts to ask for more days, just in case you are not sure how long you will end up staying. Officers are usually very generous in this area. The longest I have been given is 183 days (the maximum), though most sources say the average number you’ll be given is 90. Remember: If you want more days on your visa, just ask! If you have an address for a hotel, then tell them. If you don’t yet know where you’ll be staying, just tell them so. This shouldn’t be a problem. After Immigrations, you will be able to collect your checked luggage, if you have any, from the conveyor belts before going through Customs. Hand over your completed Customs Declaration form to an agent standing in front of the conveyor belts. Then put your bags on the conveyor belt to send them through the X-ray. After that, collect your bags, and you’re done with Customs. Walk into the lobby area. Upon entering the lobby area, you’ll be bombarded with taxi drivers asking if you need a ride. You will notice a gated barrier separating you from the Check-In area. If you already have your boarding pass for your flight to Cusco, proceed up the escalator under the sign that says “Departures.” If you do not have your boarding pass for your flight to Cusco, you must go outside the doors of the airport, and re-enter at the door on the other side of the barrier. Sometimes the door will have someone checking passports. Sometimes it won’t. From there, you must check in and get your boarding pass, and then proceed back to the other side of the barrier, but this time from the inside, where there is an opening through the gate (there is an employee standing guard at the opening, but they will let you through). Again, you’ll see a sign above the escalators that says “Departures.” Proceed upstairs. You’ll first walk through a large food court. If you have a long layover and would like to eat a meal, this is the best place to do so, since there will be more options here than when you get to the gate area. After the food court, you’ll see a line where you must show your passport and boarding pass to an employee, and then go through security. Turn right for domestic flights (international gates are to the left, in a different area of the airport). The dreaded overnight Lima layover is almost unavoidable, and sort of a rite of passage for anyone traveling to Cusco. 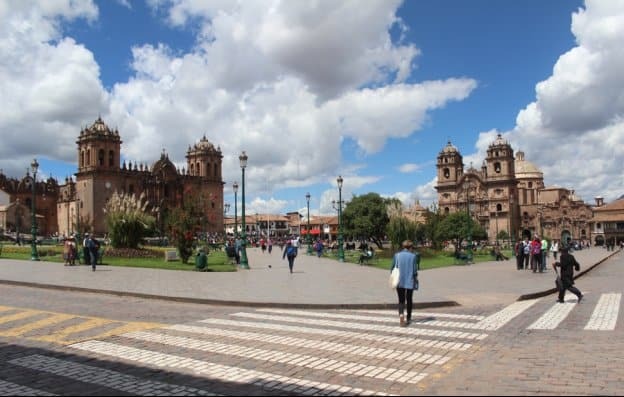 The reason layovers tend to be several hours long in Lima is that flights to Cusco happen only between 5 a.m. and 6 p.m., but most flights coming from the U.S. don’t land in Lima until after 6 p.m., leaving travelers stranded for a long wait until the next flight to Cusco the following day. If you want to avoid a long layover in Lima, you’ll need to, if possible, book a flight that lands in Lima a couple hours before the last flight of the day to Cusco. Spend the night in the airport. If you’re on a tight budget and don’t care to see Lima, this is your best bet, though certainly not the most luxurious. The good thing about the Lima airport is the benches don’t have armrests, making it easy for you to stretch across a few seats as your bed for the night. The airport does get very cold and noisy at night so be sure to wear layers and bring earplugs. There have been reports of people being asked to move, but I have never personally experienced this. I slept in the airport overnight one time, and didn’t run into any issues (other than the benches being uncomfortable and the airport being cold). If you decide to sleep in the Lima airport, you’ll be in good company. 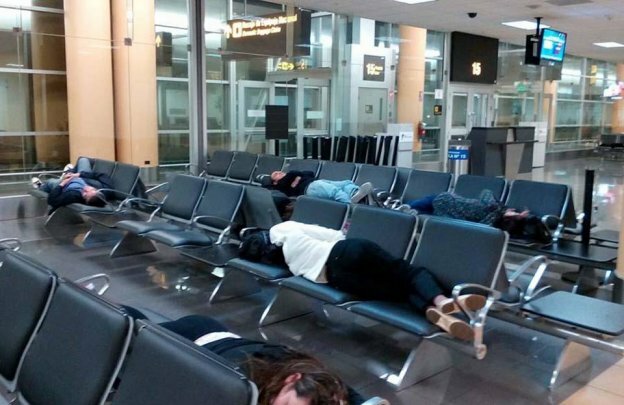 On any given night, you’ll find dozens of travelers stretched out on airport benches, waiting for their flight to Cusco in the morning. Spend the night at a hotel in Lima. If you want a good night’s sleep, book a hotel for your layover. The most conveniently located hotel is actually right inside the airport: The Costa del Sol Ramada Inn (www.costadelsolperu.com/peru/hotels/lima/). With its lowest rate starting at more than US$200 per night though, this isn’t the cheapest option. It also tends to fill up fast, so if you do want to stay here, be sure to book far in advance. Extend your stay in Lima for a visit. Then continue on to Cusco. Since you’re already there, you might as well enjoy the city! Some people choose to book flights that give them a long layover (like 24 hours) to have a bit of time to see parts of the city. Then they continue on to Cusco. If you do decide to explore Lima during your long layover, then you’ll want to take a taxi, as the airport is far from any of the Lima highlights. Taxis in Lima are notorious for being dangerous, so your safest option is Taxi Green (+51-(0)1-484-4001), the official taxi service for the airport. Their stand is located right after baggage claim, before you exit the airport. With their large green sign of listed fares, you can’t miss them. Walk up to the stand and hand them the address of your destination. From there, they’ll write you a receipt for the cost of the taxi ride, so there’s no way the driver can hike up the fare after you get in. Be sure to have cash in Peruvian soles (which you can withdraw from one of the many ATMs within the Lima airport). Insider’s Tip: When you book your flight from Lima to Cusco, choose a seat on the left side of the plane. 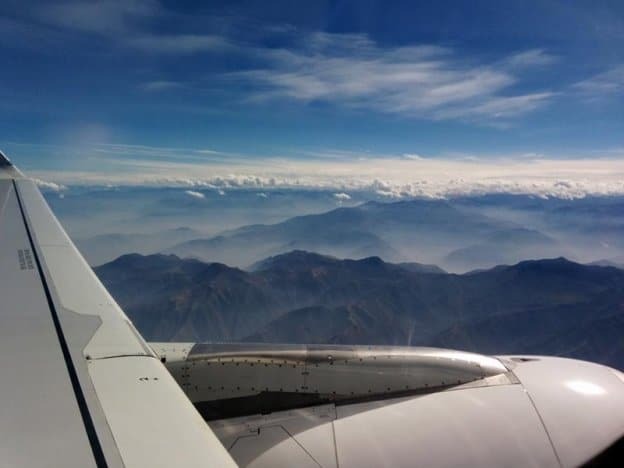 The flight takes you over the stunning Andes Mountains, and a seat on the left side guarantees you the best view of the mountain range. “Amy!” I heard someone yell through the crowd of expectant faces waiting outside the Cusco airport. After two grueling five-hour layovers and three flights, it was a welcomed sound. I turned to see Manuel, my host in Cusco, smiling and holding up a sign with my name on it. Never have I ever been so relieved to run into the arms of a stranger. And Manuel wasn’t just saying that to be nice. The second I walked into his five-story house on a hilltop overlooking Cusco, he made me feel, by his words and actions, that this was indeed my home. After helping me to my room, he invited me to lunch with his wife and little boy. 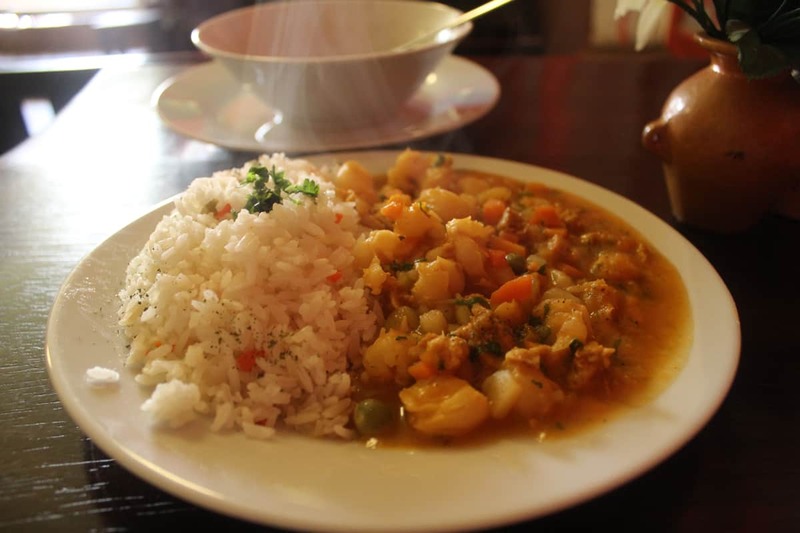 As I sat around the table in the dining room with a panoramic view of the city, sharing a meal made for me by a family I had just met, any fear or doubt I had about coming to Cusco melted away with each warm spoonful of the homemade sopa a la minuta. While your arrival in Cusco may not go exactly as mine, there are a few things you can be sure to encounter. Below is a summary of what you can expect when you land at the Cusco airport. The adventure begins! The first thing you’ll notice is the Cusco airport is very small, nothing like the Lima airport, so that should be a welcomed break. The second thing you’ll notice is there are many people soliciting you for tours and taxis. Step outside the airport, and you’ll be swarmed with drivers offering you a ride into town. These drivers are supposedly the “official,” authorized taxis in Cusco, and they are widely regarded as being safer options. However, they also cost more. If it makes you feel more secure, then go ahead and go with one of them. If you don’t know any Spanish, it’s a good idea to write down the address of your destination, along with its name if it’s a hotel or hostel, and hand it to the driver. Once he looks at it, be sure to ask, “¿Cuánto cuesta?” (“How much does it cost?”). As a foreigner, you can expect to be charged S/. 15 to S/. 20 for a taxi ride from the airport. Learning numbers in Spanish before arriving is a good idea, so you can understand prices, but usually drivers will hold up fingers to help you figure the number out. If you’d like the cheapest price, walk past the first wave of drivers, out past the barrier, and into the parking lot; there will be other taxi drivers there and their pricing should be lower. If there is a host or hotel employee waiting for you at the airport, they will be right behind the barriers when you exit the building, near the first wave of taxi drivers. Just look for the sign they are holding up. Spotting your host should be easy because there usually are not too many people standing out there. If you don’t see them, don’t panic. Have a backup plan in case this happens. If you can, call them using your cell phone. Otherwise, ask an airport employee for assistance. More than likely, your host will simply be running on “Peruvian time,” and therefore might be a few minutes late. Instead of a flight from Lima to Cusco, you could take a bus. Some people prefer this because they want to take in more scenery, but be warned: The bus takes 21 hours and goes through some twisty roads and treacherous mountains (it has to drive over the Andes to get to Cusco). Also, the savings from buying a bus ticket from Lima to Cusco as opposed to a plane ticket is not that huge, about a US$80 difference. An advantage is that the buses in Peru tend to be very plush, with seats that turn into beds and hosts to serve you meals. A popular bus company is Cruz del Sur (www.cruzdelsur.com.pe). Once you get settled into your room, relax! Your body will need time to acclimate to the high altitude and to recuperate from the long journey. Eat light meals and lounge around. If you’re feeling up for it, go for a leisurely stroll around your neighborhood. 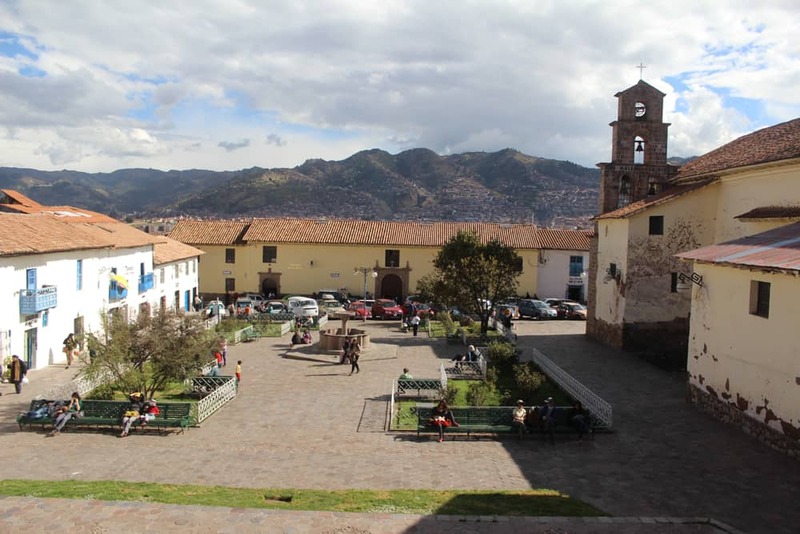 To avoid altitude sickness in Cusco, wait two to three days before doing any strenuous activities. Want more tips on travel to Peru? I also wrote a book on long-term travel to Cusco, Peru!